At Mac’s Sushi, we’re proud to serve food that customers can feel good about eating. In a marketplace dominated by the deep-fried and oil-coated, Mac’s is devoted to offering food that’s naturally part of a healthy lifestyle. We feel good when our customers feel good. Sushi is healthy by nature. It’s a wonderful source of lean protein, and its diverse ingredients draw from multiple food groups. These characteristics place sushi within a larger cultural movement toward healthier eating, and an overall lifestyle. Because sushi isn’t served hot, it can be prepared in advance – making it not “fast food” but food, fast. This also means that there’s no need for cooking or heating on premises. At Mac’s, we use only the freshest ingredients in our sushi – and it’s never saved overnight. Our chefs are from the orient and masters at their craft. When you’re our partner, you can be proud that you’re serving the most delicious, authentic sushi possible. As Sushi’s popularity has exploded during the past two decades, so has Mac’s. With more than 15 locations, and more to come, Mac’s is growing rapidly. Our locations experience high traffic in the Greater Toronto Area’s major shopping centres. Corporate clients that we are proud to have served include Toyota, TD Bank, Globe and Mail, Ontario Club, and Japan Airlines through Cara Foods. While consumers tire of yesterday’s fast food, alternatives like sushi are poised to fill a growing demand. Young adults – for whom shopping centres represent the modern urban square – have become increasingly health-conscious. 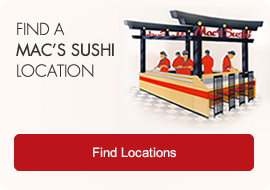 With 25 years of experience, Mac’s Sushi is a partner upon which you can rely. We provide franchisees with extensive support, training, and access to our elegant and eye-catching brand materials. To receive more information about becoming a franchise partner, fill out the form below.